The banning of sand mining in river beds has driven miners and those in the construction industry to exploit sand dunes in the Kalpitiya Peninsula, causing irreparable damage to the area. Eco-groups are up in arms over this large scale, indiscriminate mining, which is done without any Environmental Impact Assessment (EIA) or recommendation from the Geological Survey and Mines Bureau (GSMB). The Eco groups allege that some powerful politicians were behind the operation. Excessive mining of the dunes has already damaged the age-old sand formation that acts as a wind barrier in the area. While the authorities responsible for the conservation of the eco-system of the area are passing the buck, lorry loads of dune sand is being transported from these areas to Colombo and other parts of the island, daily. 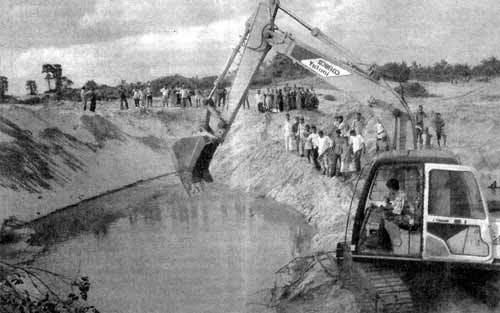 The large-scale removal of sand from dunes in the Kalpitiya peninsula and the sea belt from Udappuwa to Palavi in the Puttalam district of the North-Western Province has caused serious damage to the eco-system as well as to the livelihood of the villagers, who mainly depend on agriculture. Due to this, the villagers of Kalpitiya Peninsula now fear that they may lose their lands. Hemantha Witanage of the Centre for Environmental Justice (CUJ) who has requested the Minister of Environment and Natural Resources to take prompt action to stop the illegal mining, blames Ministry officials for issuing a large number of permits for sand mining to supporters of a certain political party. "We wonder how politicians issued these permits by-passing the existing laws of the country, which clearly state that an EIA is mandatory' for sand mining in sensitive areas," he asks. The major income generator for most of the families living in these areas is crops such as chilli, batana (pumpkin), onion and other low country and upcountry vegetables. Some depend on fishery and tobacco cultivation. Half of the country's chilli and vegetable harvest comes from these areas, despite the prevailing water shortage. According to Witanage, the water table in the peninsula and surrounding area is very unstable and is mostly saline, except for a few feet of fresh-water layers, due to seepage of sea water and water from the Puttalam lagoon. "In most areas the fresh water layer is only about one foot and farmers use this water for agriculture at intervals. And the water table is already polluted due to the frequent use of fertiliser and pesticide. Due to this nitrogen level in water is high in these areas," he says warning that the damage caused by sand mining would destroy the existing vegetation and the sand dune ecosystems in the area. Sources at the Environmental Ministry claim that the EIA should be done by the North-Western Provincial Council prior to issuing the permits for sand mining projects such as inland mining of cumulative areas exceeding 10 hectares or mechanised mining and quarrying operations of aggregate, marble, limestone, silica, quartz and decorative stone within a kilometre of any residential or commercial areas. An approval from the Geological Survey and Mines Bureau (GSMB), based on the environment impact assessment of the area, is also needed to commence sand mining. "Dune sand is not an environment friendly alternative for the construction industry as this will create major environmental problems especially in water sensitive areas such as the Kalpitiya peninsula and its surroundings," Witanage points out, stressing the urgent need to introduce alternatives for river sand. "We also believe that there is a big problem in meeting the sand demand of the country. But dune sand is not the best option," he says. However, the CEJ blames the Ministry for allowing those with permits to mine river sand, to mine sand from the dunes. "These permit holders are not registered as hardware owners and do not have mining licences and this is a violation of the provisions of the Mines and Mineral Act No 33 of 1992," Witanage claims. Witanage alleges the Geological Survey and Mines Bureau (GSMB) has already issued more than 1000 trading permits and more than 5000 transport permits to transport sand from anywhere in the country. The Minister of Environment and Natural Resources, A.H.M. Fowzie told the Sunday Observer that sand in the particular area have been mined extensively during the past two years and accused the North-Western Province Environmental Authority of being blind to the issue. According to the Minister, the Authority has the power to stop the illegal activity. "But it goes on unabated. I asked for a report from the CEA," he says adding that he is not in a position to do anything prior to the CEA's report. Meanwhile, following a report by a team of officials of the Coast Conservation Department (CCD), its Director Dr. R. A. D. B. Samaranayake directed the DIG North-Western Province to take immediate action to arrest the illegal sand miners, last week. "We got a large number of complaints about sand mining operation in Kalpitiya and other areas, which will severely affect the entire coastal environment in the area. So it should be stopped," he stressed. The CCD has already lodged a complaint with the police. "It is illegal and police should arrest illegal sand mining," says Dr. Samaranayake, who attributes the main cause to a shortage of river' sand following the banning of sand mining in rivers in some areas. "It is time to encourage off-shore sand mining, which is 20 metres in depth, to meet the increasing demand for sand in the country. Off-shore sand is ideal for construction after washing," he says. Saman Senanayake, Director, Provincial Environmental Authority (PEA) of the North-Nestern Province confirms that there was severe damage due to mining of sand dunes, which protects inland vegetation and acts as a wind barrier, blamed the GSMB for issuing licences for sand mining and transportation. According to him, provincial PEAs are not vested with powers to deal with excavation, exploration or transportation of sand or minerals. "Under section 28 of No. 33 of Mines Bureau Act no one can mine, excavate or transport any non-renewable resources such as sand and mineral without a permit from the GSMB. Even a rock of your own garden cannot be blasted without their permission. Therefore, the GSMB should take legal action against those who do mining without a licence from the GSMB," he point out. Senanayake said that EIAs can be done only for prescribed projects but not for each and every site that mine sand. "Some have requested us to issue ‘Site Clearance Certificates' but we cannot do so because these sites are in high sensitive areas," he added. He also said that he will be meeting Minister Fowzie, along with Chief Minister Athula Wijesinghe next week to discuss what action should be taken to stop this massive damage. See also: Udappu's sand dunes face annihilation.